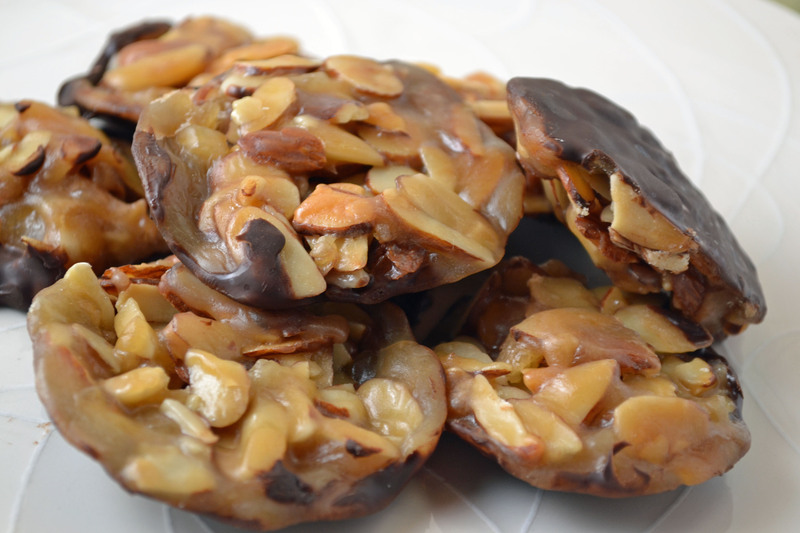 I’m no expert in making Florentines but it’s hard to go wrong with these gooey chewy chocolate dipped cookies. I realize they should probably be crispier, thinner, maybe rounder, and more even. But I’m not complaining. A cookie recipe that my father remembers my grandmother making, he confirmed that these turned out how she intended. Candied orange peel is the special ingredient that makes these different from many Florentine recipes that use grated orange zest. It maybe a little harder to find, but candied orange peel is what will definitely win over those orange-chocolate lovers. Not a orange-chocolate fan (I’m not particularly crazy about it myself)? Try candied ginger and you’ll have a whole different cookie. A note about this recipe: those of you who are foolish ambitious enough to try to replace the shortening in this recipe with coconut oil, feel free but just make sure you use a very a mild one. Otherwise, the results are..lets just say, less than ideal. I would recommend skipping the shortening all together and just using melted chocolate as is. Preheat oven to 400 degrees. Grease baking sheets well. Combine sugar, cream, honey, and butter in a heavy saucepan. Stir over low heat until sugar is dissolved. Raise heat and boil without stirring until soft-ball stage (a ball forms when a bit of mixture is dropped into cold water) or until mixture registers 238 degrees on a candy thermometer. Cool slightly. Stir in orange peel, nuts, and flour. Drop small rounds of batter on the prepared cookie sheets, leaving at least 2 inches between each cookie. Flatten each cookie with a fork dipped in milk (if necessary). Bake 8-10 minutes or until cookies are golden brown. They will spread while baking. Therefore, immediately upon removing them from the oven, pull each one back into the shape of the round with a greased 3-inch cookie cutter. Using a cutter will ensure their final roundness. When cookies are firm, remove from cookie sheet and finish cooling on a rack. Melt chocolate in a double boiler. Stir in shortening. 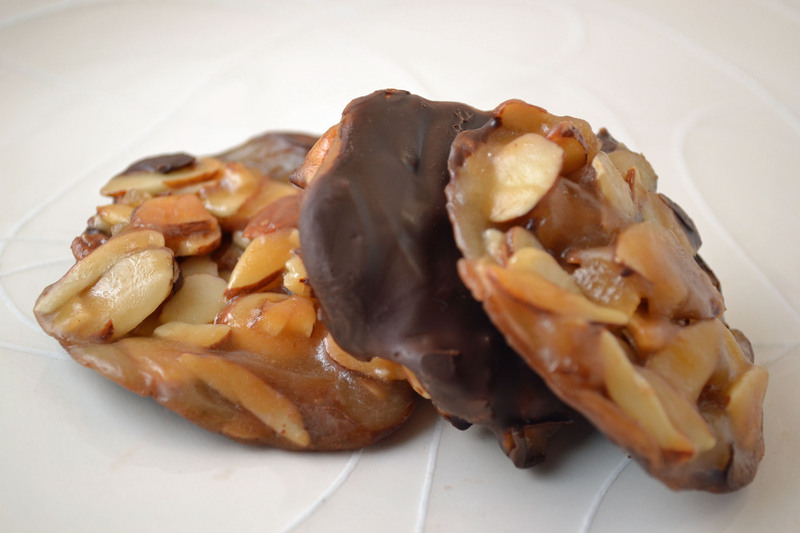 Coat underside of each cookie thinly with melted chocolate. Place in refrigerator long enough to set chocolate.